Everyone who fled the Camp Fire has a story about when they knew things were going to be very, very bad on that fateful Thursday that the flames tore through the town of Paradise and the surrounding region. Jeremy Vesely’s came when the spot fire on the ridge above his newly-built home went from smokey to tree-engulfing flames in 30 minutes. For Rachel Aradia, it hit when she saw the panic on her coworkers’ faces as she walked into work at Sundance Art Glass. Further south, Rebecca Gamette’s moment of reckoning came when she went to feed the donkeys at 6:30 a.m. on her and her husband’s Butte Valley property. The thick smell of smoke hung on the early morning air of like an unwelcome houseguest. When she saw the smoke plume hovering over Paradise 10 miles to the northeast, the place she had called home until 2008, it crystallized. “We’re in trouble,” she told her husband. These are the stories that will be recounted in bars and at church services, retold to children and grandchildren. They hold power because they’re a clear demarcation line of before and after the fire that basically wiped the 27,000-person town off the map. And they could be what keeps a community together as thousands of people who lost everything try to decide what comes next. If Paradise the community still exists, the town that once was is gone. Until last week, it was a place like countless others across the West, sustained by a mix of retail, healthcare, and forestry as well as education courtesy of California State, Chico and Butte College in neighboring towns. The town featured a busy commercial strip that added a Starbucks last year, and a national forest just outside city limits. Paradise is considered part of the wildland-urban interface, the fastest growing type of land cover in the U.S. The growth of that interface means more American than ever are living in harm’s way when fires explode, an increasingly common phenomenon as the climate warms. But even if Paradise is an Everytown USA in one sense, what’s happened there is also singularly horrific. At least 7,860 structures have been lost, according to the latest estimate from Cal Fire. The number has and will continue to rise as firefighters assess the aftermath there and the damage to surrounding communities like Magalia. Already the most destructive and deadliest fire in California’s history, the Camp Fire will almost certainly be a multi-billion dollar disaster. And the disaster area could be uninhabitable for weeks or months. Even those who still have houses will have a hard time going back if and when they’re allowed to. Roads are clogged with debris, power is out, and water is unsafe to drink. Research shows that nearly half of all homes are rebuilt in the wake of wildfires within five years. It’s unclear if it’s typically community members or new developers doing the rebuilding. But the cost, emotional duress, and myriad challenges that crop up can create huge barriers. All with nothing remotely close to the scale and scope of the Camp Fire’s devastation in modern American history, all that research may now be out the window. Vesely, whose house survived the flames even as some of his neighbors’ houses did not, is currently staying about 80 miles south of Paradise in Roseville. But he said he and his wife are considering buying a trailer so they can be mobile over the coming months—something afforded to him thanks to working remotely for a software development company—to freely visit neighbors, friends, and members of his church who have been displaced. In a time where the world has been turned upside down, those human bonds are crucial for staying sane. Ironically, he and his wife built their house to serve as a meeting place for church members, but now there’s no telling when they’ll be able to gather again. He said his pastor has been checking in with people on Facebook, and it’s possible that they could use Facebook Live to hold services and retain some semblance of community. Gamette’s house also survived. Though she has water in the form of a year-round spring, electricity is still out at her property so she can’t access that water. Her plan is to head back with a generator in tow and live as best she can with that until power is restored. She knows her task is likely going to be easier than what her friends in Paradise face, though. In Chico, a town of 93,000 about 30 minutes down the road from Paradise, residents have welcomed survivors. The local food co-op gives out free soup and is handling shipments of food and supplies coming in from other co-ops around the state. The Chico Peace and Justice Center is collecting and distributing other items. Even a local tattoo shop is all-in on the support, distributing blankets and clothing to people who left Paradise with only the clothes on their backs. But the crushing reality is that thousands of people are now homeless, including Paradise’s entire town council. The Walmart parking lot in Chico has become a tent city. And with up to 10 percent of the county’s housing stock wiped out and many Paradise residents facing the grinding process of insurance claims, it’s simply unclear whether those who want to stay close to home while they sort things out will even be able to. Numerous businesses were also lost to the flames, meaning many are also jobless. Those competing pressures are enough that some are already considering leaving for good. “The local area won’t have enough rentals and jobs to absorb those displaced,” said Aradia, who lost the home she was living in with her father. With her place of employment also wiped out and her father close to retirement, they’re planning to leave to be closer to family in Oregon. Insurance could help some like Vesely, whose policy could help fund his trailer plan. But moving forward, insurance rates will remember the blaze. California requires insurers to cover policyholders while they’re rebuilding and at least one renewal, but after that, rates could spike. And while California has a program called the FAIR plan that insures high-risk individuals, those policies come with high premiums some may not be able to afford. That opens the door to the prospect of speculators coming in and buying up property, turning Paradise into something it wasn’t. There’s also the uncomfortable question about whether Paradise even should be rebuilt at all. Like the coasts, the wildland-urban interface is becoming a risky place to live in our warming world. Make no mistake: The thousands of people who are homeless because of the Camp Fire are climate refugees. And with forests set to become more flammable, there could be more like them if we don’t take a hard look at how we choose to live. It’s not like Paradise was unprepared. 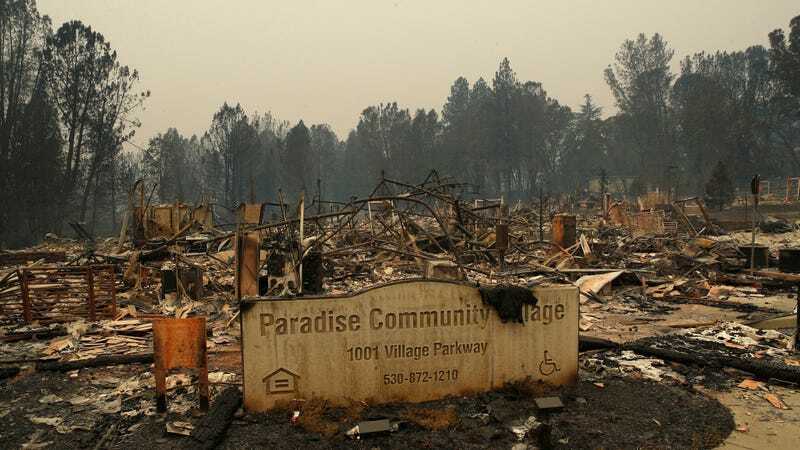 It created the Paradise Ridge Fire Safe Council in the wake the 2008 Humboldt Fire that destroyed 74 homes in town in an effort to prepare for the big one. The town had evacuations zones. When residents saw the Camp Fire was headed for town, many quickly cleared the ubiquitous pine needles from their roofs before dousing them with water and fleeing for their lives. None of it mattered. And no amount of preparation will necessarily be enough to protect whatever becomes of Paradise in an era where fire season is year round long and major conflagrations are the new normal. The residents in Paradise will have to confront the same thorny questions as their brethren in Mexico Beach, which was rocked by Hurricane Michael earlier this year. Frankly, there are no easy answers.